Reading through the winning $170 million proposal from the Partnership for Assessment of Readiness for College and Careers, you can come up with a pretty creditable approximation of an end of year report for their design as it stands now. You can click the image above or get a pdf here. ELA-1 and ELA-2. 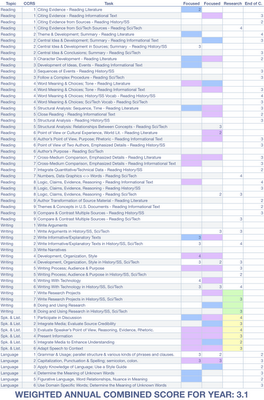 Focused Literacy Assessments: Writing from Sources. These through- course components are designed to measure the most fundamental capacity essential to achieving college and career readiness according to the CCSS: the ability to read increasingly complex texts, draw evidence from them, draw logical conclusions and present analysis in writing. These focused assessments offer opportunities early in the school year to signal whether students are on track to readiness. The prompts for these components will be modeled on the CCSS; each component will consist of one to two extended constructed-response items that require students to write in response to a text. My reading of this is one or two essays, one at the end of first quarter, another at the end of the second quarter. You can pretty much write the prompts right now, given the specificity of the standards they're to be based on, e.g., Determine the theme or central idea of [THE TEXT] and analyze in detail its development over the course of [THE TEXT], including how it emerges and is refined and shaped by specific details; provide an objective summary of [THE TEXT]. In an essay, s'il vous plaît. The background color refers to the focus standards (blue) and activity/assessment standards (violet) from the first half of the year Common Core Curriculum Maps for the first half of 9th grade, iirc. I really just included them as a frame of reference for myself and saw no reason to take them out. Notes on Bogosity: The scoring system (1-4) and example scores are arbitrary and bogus. I did try to score the particular standards that would be scored for each particular assessment. ELA-3. 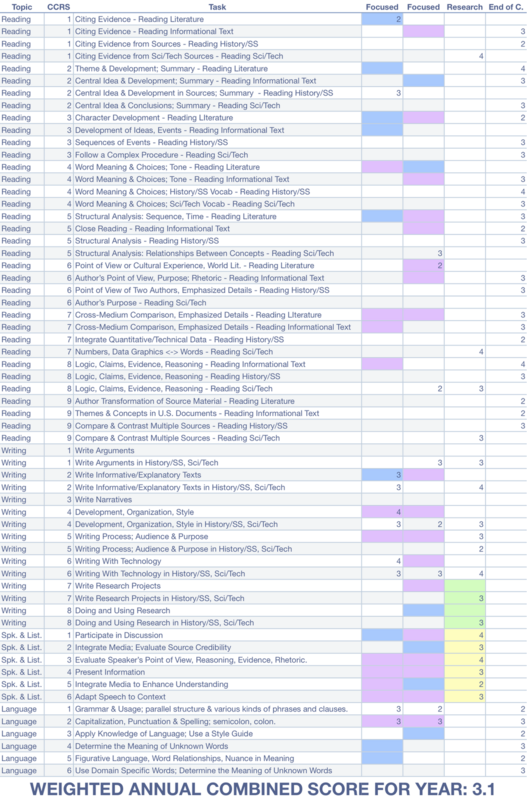 Extended Research/Writing Assessment. The evidence is overwhelming from employers and colleges alike that research skills play a critical role in postsecondary success, and the longer performance task in ELA/literacy is designed to measure the CCSS related to research and analysis. Over several sessions, students will be asked to identify or read a variety of materials and to compose a written essay based on them. For example, the assessment could require students to research independently several sources and evaluate their credibility to compose a coherent account of a subject or to take and defend a position on a controversial topic. Students also might be asked to synthesize information from a range of text formats. Such research skills are essential for college and career readiness but are rarely assessed by current summative tests and thus are often neglected in the classroom. This is roughly end of third quarter. I highlighted in green the research standards that would be the biggest focus of this assessment, along with the speaking and listening standards in yellow, which are supposed to be assessed as a classroom activity but not as part of the larger accountability system. I'm pretty much assuming that the writing standards will be assessed as part of the first three here. ELA-4. End-of-Year Literacy Assessment. This component will be a computer-scored assessment that leverages advances in computer-enhanced item types. It will build on high- quality, authentic texts at the appropriate level of complexity; meaningful distractors for any selected-response items developed by content experts; and computer-enhanced items such as ones enabling students to view or listen to digital media. The assessment will draw on higher order skills such as critical thinking and analysis, measure language use and vocabulary, and use digital technologies to assess hard-to-measure skills (for example, by asking students to listen to a poem or a view scene from a play). Items will sample a range of cognitive demand and be designed to tap deeper into student depth of knowledge. As with the focused and longer through- course components, the end-of-year ELA/literacy component will model the prompts as closely as possible on the CCSS. The aim is for students to demonstrate command by reading unexpected text independently and proficiently. This is end of year and is the more traditional "standardized test." All of the above is to be munged together into one weighted annual combined score for the year. This example is for 9th grade, but the strangest thing about this plan is that this is the shape of every year of English class from grades 3 to 11. As in any art or design task, in curriculum design you have to balance repetition and variation, and there is no proof to show you've hit that balance in any given case. But man, I don't think these folks have given much thought to what it'll feel like to belly up to the fake research paper test for the sixth time, never mind starting January for the sixth straight year by prepping for the fake research paper. Each year prepping for four essay questions that you feel like haven't changed since elementary school, with four new ones that are slight variations on the old ones. And it is not clear to me that the first two focused essay questions are the right idea at all. Wouldn't you want your formative assessments to be broader and more closely aligned with the final assessment? How much weight is a test given at the end of the first quarter going to have in the final grade, or, in particular, the assessment of the teacher? Anyhow, hopefully this little exercise has made this process seem a little more concrete to you. I couldn't log onto EVE tonight for some reason, so I figured I might as well get it off my chest and desktop.